If you find yourself ready for a truck that can actually keep up with your on the go lifestyle, then this Tacoma is a great place to start. This Toyota Tacoma is what happens when a 50-year legacy of toughness meets a whole lot of modern tech and combine it all into one unstoppable package. And there's more to this machine than just its aggressive good looks. Advanced off-road technologies and heavy-duty components take this truck to places others fear to tread. A powerful and efficient engine has got the goods to get you to the end of the map and back. Inside, superior comfort and tech keep you feeling refreshed during those hard-charging expeditions. It's time to get in touch with your gnarly side. This midnight black metallic Access Cab 4X4 pickup has a 6 speed auto transmission and is powered by a 278HP 3.5L V6 Cylinder Engine. 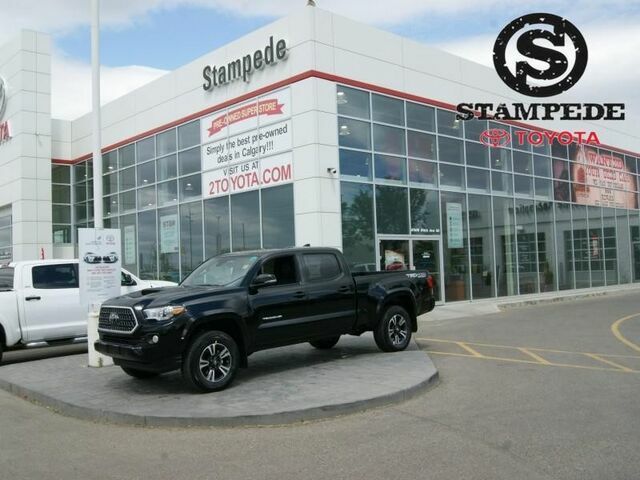 Our Tacoma's trim level is TRD Sport Upgrade Package. This vehicle has been upgraded with the following features: Rear View Camera, Bluetooth, Toyota Safety Sense, Airconditioning, Adaptive Cruise Control, Remote Keyless Entry, Power Windows.